Sport For Charity - Upping your training? Beat the hunger monster! Upping your training? 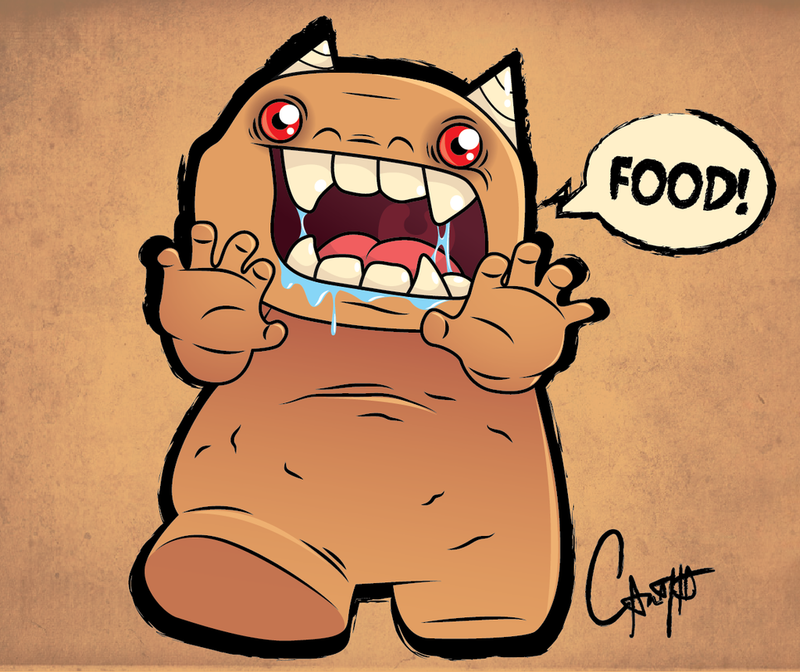 Beat the hunger monster! You think you’ve done the hard part: you’ve coaxed yourself up off that couch and got moving. You’ve set yourself a fundraising challenge, want to lose weight, get in better shape, and be healthier, to meet the demands of modern living. As we start to get the hunger for training and up our distance or intensity – regardless of what sport you’re into, but running’s a real case in point – we often start to get, well, a lot more hungry, too. If you think about it, it makes perfect sense: if you’ve got into doing a 5k at a pace of 10.5k/hr, 3 or 4 times a week, you’re spending an extra 1,600 calories at least, every week. That’s almost an entire day’s eating you’re burning off. But when you’ve eaten all the fruit you brought to work with you by 11am, the Hobnobs or home-baked brownies your co-worker perched at the end of your desk can be difficult to resist. So how can you avoid undermining your training regime with a 3pm biscuit binge? If you’re looking to tackle hunger, plan what you’re going to eat in advance. Slow-release carbohydrates and protein are your friends, as they take longer to digest and help keep hunger at bay. Porridge with fruit, or protein-rich poached eggs with steamed smoked fish is a great way to start your day. Grab a dense, low-fat yoghurt mid-morning or mid-afternoon, such as strained Greek yoghurt. A pack of oat cakes with a spiced humus is a great snack option (although make sure you portion it out, don’t bring in the whole pot), and always keep a packet of (unsalted, unroasted) mixed nuts at arm’s length to pick at. Get creative – do your own take on chain favourites, such as a pot of boiled egg and spinach, à la Pret A Manger. Make sure you stock up – plan your week of eating, shop ahead, and you’ll give yourself no excuse to reach for a sugar-packed cereal bar. When my sister was training up for a charity boxing match, she built up her muscle mass and got ravenous with it. Yet she always managed to maintain her shape. Her secret was routine; having set snack times that she stuck to, geared up for and looked forward to. Set reminders on your smart phone if needs be – and if you snack before you reach the uber-peckish point, it’ll help you keep control. Is your get-fit regime a real shift from how you were before? Are you a fitness fan who loves to tuck into a big bar of Dairy Milk solo? If so, some habits die hard, so stopping yourself from eating sugar, drinking alcohol or dipping into a crisp packet all in one go can be a big ask. Again, planning is key. If you really need that sweet or savoury fix, set yourself days where you can relax the rules a little. Make the weekend a time where you can indulge, but stick to your plan during the week. Or instead of cutting out everything, cut out one, or make a swap – such as salted almonds instead of crisps, or a pot of granola with honey, banana and peanut butter, instead of chocolate. With so many great charity challenges to choose from, you’ll have your own reasons for doing this particular event. So give yourself plenty of visual reminders. Stick up your fundraising goal on your bedroom door, and messages of support from your mates. If you’re doing a charity challenge in someone’s name, why not have a warm memory of them at hand – a treasured photo, one of their mottos, or something they gave you. Keeping a reminder on your person, such as an elasticated band on your wrist, to ping if you start feeling the urge to break your stride, can help you regain focus. But there’s also no substitute for speaking to a friend who understands your pain. You can share tips – such as trying out a sugar-free cook book – and get through it together. Click here for more healthy eating and training tips.